The Apartment “Dream Holidays” provides comfortable accommodation for families, couples & small group of friends. It is 60 m2 , located on the 4rth floor of a building and accommodate up to 6 persons. It’s recently full renovated in modern style and consists of 2 bedrooms nicely furnished with all the comforts you would need for a pleasant stay, an open plan kitchen area, a living room area with 2 sofa beds, bathroom with bath and balcony with view over the town, the sunset and side sea view. If you are looking for a truly homey feel this is the best place for you! You'll enjoy yourselves in a relaxing, comfortable, beautiful and hospitable environment ! 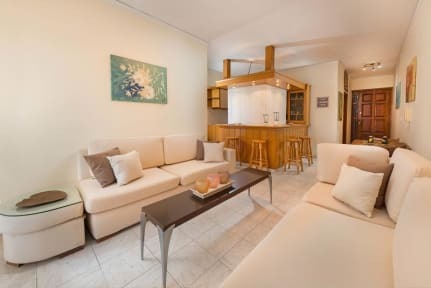 The Apartment “Dream Holidays” located in the heart of Ialyssos city (is also known as Trianda) which is the second-largest town on the island and one of the most popular resorts in Rhodes. Just 500 meters away from the organized sandy and pebble Ialyssos beach which offer a number of water sport activities including windsurfing, kite surfing and sailing. 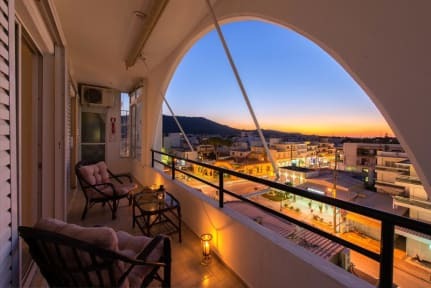 All conveniences are within walking distance , Super markets , Bakeries ,Restaurants, Bars, Tourist Shops, Banks with ATM machine , Children’s playground ”Akantou” ,Internet cafés , Clubs and beach taverns for a romantic meal watching the sun set over the water . Its central position allows easy access to all amenities & local attractions.